Unless you’re replacing like for like, buying a radiator can be quite a technical process. You may not know your BTU’s from your Watts or understand the impact that size and finish can have on the warmth of your room. This radiator buying guide hopes to enlighten you on what will be the perfect radiator for your space. What heat output does your space need? The chances are you’ve come to this guide knowing that you need a radiator for a specific space in your home or perhaps the whole of your home. The single biggest factor that should influence your buying decision should be the heat output you require for a given area. Measured in BTU’s (British Thermal Units) or Watts (for electrical products) this is a measurement of the output required to adequately warm a given area. A larger space will require a higher output and possibly one or more radiators. Whereas a small bathroom may only need a small towel warmer. To work this out head on over to our handy BTU calculator and input the measurements of your space room by room. This will give you a BTU rating to aim for. Generally going for a slightly higher output than required will provide good control over a space. You can always turn the heat down but a small underpowered unit will not warm a larger space. What size radiator do you require? The bigger the radiator the higher the heat output. If you’ve already undertaken the BTU calculation for your space you could probably head on over to our radiator products and start getting an idea of the kind of size you’ll require for the space. For example if we take a room 2m x 2m and 2m high, like a small UK bathroom, with a window on one wall, a heated room beneath and a loft space above then the requirement would be approx 1289 BTU’s or 377 Watts. 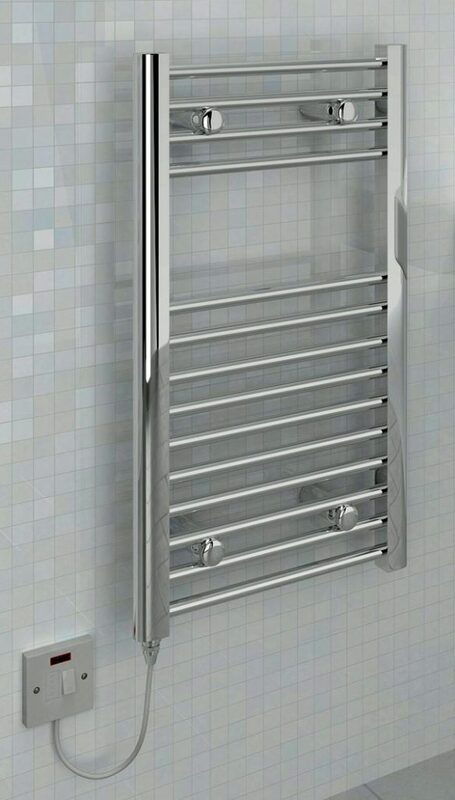 Taking the popular 500mm wide Phoenix Athena as an example this bathroom would need a towel rail measuring 1200mm in height. With the 1617 BTU output from this model more than satisfying the needs of the space. Of course if you haven’t got a space 500mm wide you could go for the slimmer, taller 350mm model with a height of 1400mm providing a similar heat output. In other parts of your home you could opt for more double panel or multi-column offerings to achieve the same result from a smaller footprint. Where are you looking to fit your radiator? The location of where the radiator is to be fitted in the home and in the room specifically will dictate many of the following decisions. You may also be limited if you’re removing and replacing an existing radiator. What format of radiator do you require? Floor, Wall, Rack or Portable? The format of heating radiators has had to adapt to the higgledy-piggledy nature of homes we have here in Britain. We have anything but square boxes with true walls to fit them in. For instance if you have little wall space in a bathroom you could consider a rack style wall mounted radiator, these are often installed high above a bath in hotels so that towels are within easy reach. If you’re stuck for wall space in your bedroom you could consider a floor-standing traditional style radiator that could sit at the bottom of your bed. This design and location is more popular than you realise. 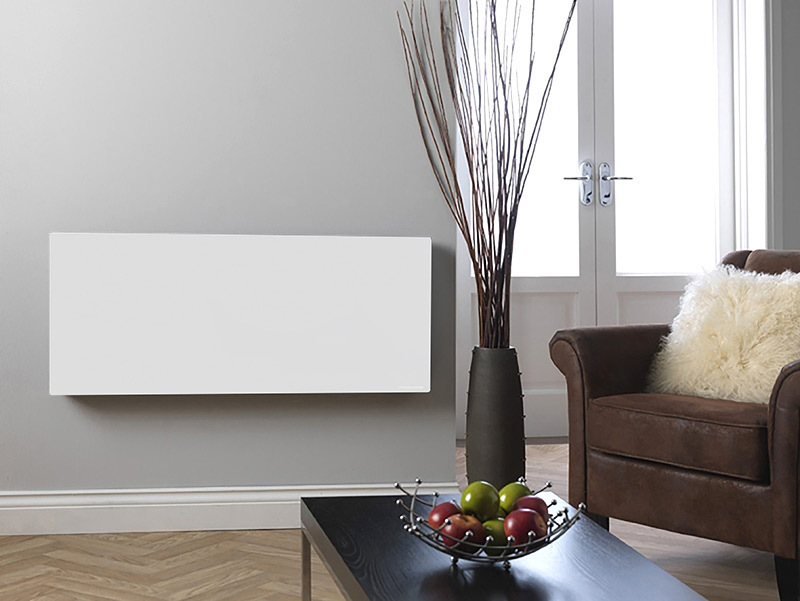 Put simply radiators can be mounted to the floor, wall or be free-standing. Another option not covered by this guide would be underfloor heating. Which would be best for your space? What design are you considering? 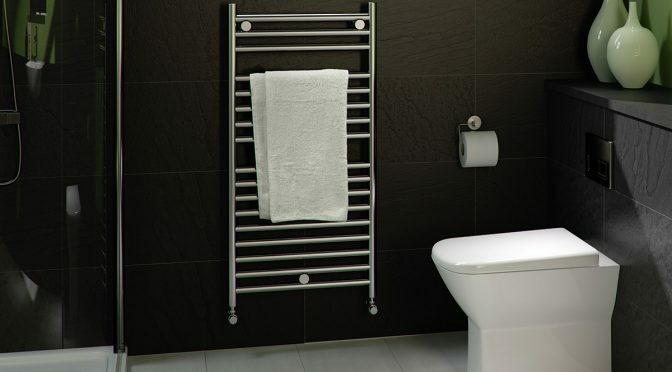 You may just be looking for a basic towel rail to dry towels and warm your bathroom. Or you could be looking for a dual function product like a radiator that incorporates a mirror or even a TV, yes they do exist. Or perhaps you’re after a product that is a show piece in its own right. The kind of radiator that gets attention from visitors to your home. Those with classically styled homes will love the multi column central heating radiators from Phoenix or Hudson Reed. Partner with some vintage looking valves and wall retainers and you have some authentic looking old school radiators. Alternatively you could go for something uber contemporary. Flat panel radiators are available in some amazing designs for less than half the price they were 5 years ago. This is thanks to modern manufacturing techniques and the fact that they can be made from cheaper more abundant metals such as aluminium. The large surface area of a flat panel design makes them highly efficient, indeed most high BTU radiators are of this design. These are generally plumbed into your central heating system. For something a little different and new to the market take a look at Infrared Heating Panels. These are slim, have great heat outputs and manufacturers claim them to be the most efficient design of radiator available. How Does A Radiators Finish or Construction Effect Heat Output and Performance? You’d be surprised to hear the the colour or finish of a radiator can effect the heat output. For example a painted white or black finish will have a slightly higher heat output than a chrome radiator of the same size. This is because of the internal heat reflections, heat finds it slightly harder to escape the chrome surface. Whether the surface has a gloss or matt finish will also effect the output very slightly with matt finishes being more efficient. Of course you’re probably not too fussed about losing a few BTU’s for the sake of that amazing gloss red centre piece in your living room. The construction material and shape will also effect heat output. A towel rail with all the gaps between the rails is never going to pump out the same heat as that flat panel radiator beneath your window. It simply has much more surface area to work with. However you can hang multiple towels on the towel rail so it’s all about your own specific needs. Cheap panels radiators are generally made of steel and then painted. Once they’re warm they stay warm for some time. You can often here the clicks as they contract and cool. Aluminium radiators get hot much quicker than their steel or cast iron counterparts as the metal conducts more efficiently. They also cool quicker. Without getting too techy the boffins measure the rate that heat can radiate from an objects surface with an ‘emissivity‘ rating. Material and colour both effect this rating and the higher the emissivity the more efficient a surface is at radiating heat. What Fuel Type is Best For Your Home? The majority of houses in the towns and cities of the UK rely on gas fired central heating to heat them. But there are alternatives and those who are out of reach of gas utilities often rely on them. These might include oil filled radiators and electric based alternatives like storage heaters, electric towel rails and infrared panels. It’s not always convenient to have the central heating on. During the middle of summer you may want to dry towels and clothes but you don’t want to heat the entire house. In this scenario a dual fuel or electric only towel rail might be convenient. An electric only rail is usually controlled from a switch, some also have thermostatic controls to adjust the temperature. Models like these are useful where plumbing pipework in is difficult or too costly. If you’ve got a concrete floor this can often be the case. Dual fuel products like the popular Flavia or Athena models from Phoenix get the best of both worlds. They’re plumbed in to your main circuit and work as normal for the majority of the year. Then come Summer you can close the valves and turn on the electric to the heating element, 2 heating devices in one. A complete departure from traditional style rails and panels are those that use Infrared technology. Without the constraints of plumbing there will never be a need to bleed them and given their simple flat panel looks they can be mounted high on the wall or even on the ceiling pointing down. The radiant heat which is emitted from them feels similiar to the Sun shining on your face. These panels heat the objects in front of them unlike convection based heating radiators that warm the air around them which circulates around the room. If you have electricity you can install them easily. You can find all you need to know about infrared heating in our dedicated guide. Radiator valves are the necessary interface between your radiator and the pipework of your central heating circuit. If you have central heating you will need a pair of these for each radiator you purchase. There are numerous cosmetic designs but the thing you need to ensure is that you pick the correct shape for your installation. 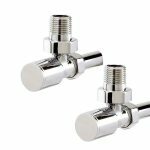 For example if you have a wall mounted towel rail with bottom outlets and your plumbing is beneath the floor then you will need a pair of ‘straight’ radiator valves. This will assist the flow of water from underneath your floorboards into the radiator, around the radiator then out of the bottom outlet and under the floor boards once again. As well as the straight design there are also ‘angled’ and ‘corner’ designs. Less popular are the twin Euro designs that join the pair into a single lump of metal. Most valves simply turn on or off the flow of water to your radiator. 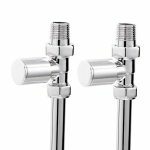 If you want finer adjustment to temperature on a per room basis then purchase thermostatic, or as they should correctly be called, hydrostatic valves. 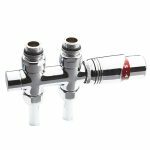 That cocky plumber might even call them TRV’s – thermostatic radiator valves, they’re all the same thing and this is how they work. First things first, TRV’s do not control the boiler only the radiator they are fixed to. They do this by means of a wax motor which expands or contracts depending on the surround air temperature, thus opening or closing the valve and the flow of water. The simple rotary control is labelled 1-5 with 5 being the hottest setting. Many also have a * setting which offers frost protection. Good if you’re going to be leaving the house for holidays during colder periods. One final piece of advice when choosing valves. Don’t purchase a radiator costing hundreds then install with cheap plastic valves. Valves do fail and when they do it can be a relatively expensive job that will need specialist help from a plumber. At the very least go for a pair that have brass bodies, good metal fitments and don’t spend anything less than £10 a pair. You’ve been warned! What are the most efficient radiators? As we near to the end of our radiator buying guide we thought we should touch a little on efficiency. Utility bills don’t look like they’re ever going to get an cheaper. So what are the ingredients that make up an efficient radiator? A specification that can convert the maximum amount of energy burned in your boiler into heat in the rooms where you need it. So the most efficient radiators are black, matt and flat like the Hudson Reed Ceylon, above. All that said the design of the radiator will no doubt influence your decision more than heat efficiency. You may not know but there are a plethora of handy furnishings and accessories available for your radiator. 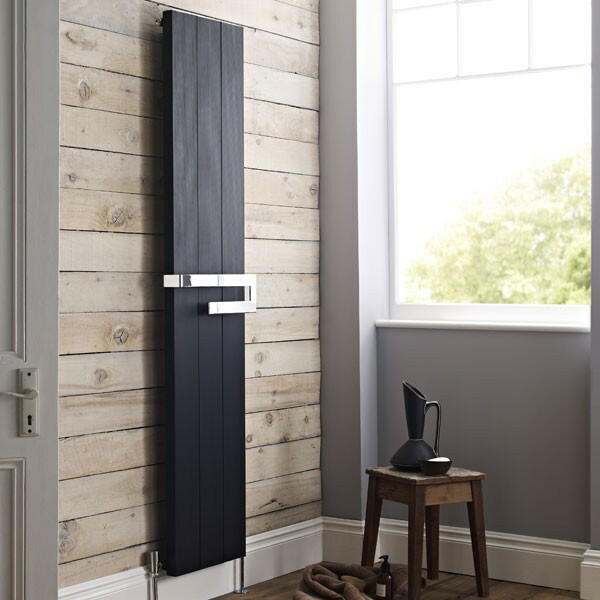 There are towel rails that can be added to flat panel designs, hooks for hanging robes from and even magnetic gizmo’s for extending the functionality of the humble radiator. If you’ve opted for a design that is less than convenient but looks the part these may well help you extend the functionality even if only on a part time basis.